Like it or not, the smartwatch appears here to stay, but the best may be yet to come as companies like Motorola secure patents that would allow for wearable devices with wrist-fitting displays. The US Patent and TradeMark Office has published a new Motorola patent application that outlines how the Google-owned company might introduce a wearable electronic device with a flexible screen. The patent application was first filed on June 19, 2012, revealing that Motorola already had its sights on wearables well ahead of the current smartwatch craze. Of course, Motorola has filed plenty of other patents and trademarks for wrist-friendly wearables as well as flexible displays, but the newly published application is the first we've seen from the company that combines them in one gadget. Motorola's patent specifically details a method whereby "a flexible chassis module" can be coupled to a display module. 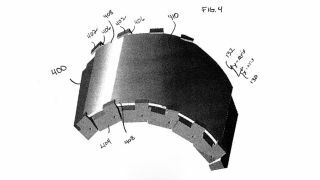 "This method allows flexing of an electronic device with a flexible display for curved viewing, if desired, or bending with minimal stress," the patent reads. The technique described by Motorola is not unlike a traditional metal watch band, which connects a series of narrow links to provide the necessary flexibility. The difference here is that the entire display of a smartwatch could bend with the chassis. It's all futuristic sounding, but first Motorola will need to figure out how to make equally bendy circuit boards, if not sidestep the laws of physics entirely. Apple, by the way, is rumored to be tinkering with flexible tech for the iWatch. There's patents to prove it. Read our review of the Samsung Galaxy Gear!